Sinners do not deserve salvation. 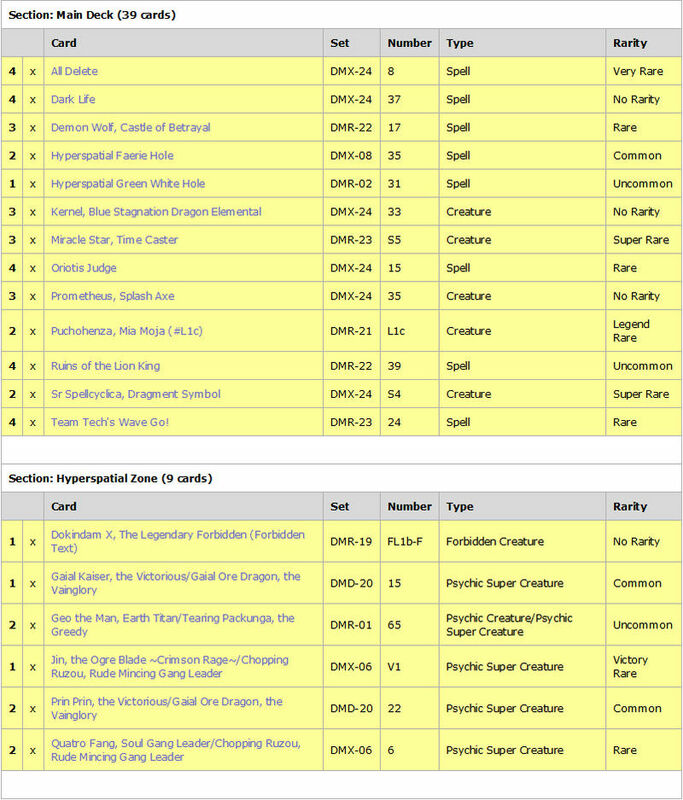 The following is the All Delete deck that i used on tco. Of course i won't be able to build it irl but it's nice to use on TCO and works pretty well. Basic strategy is to ramp enough mana using mana boost spells like Dark Life, ruins of the lion king and hyperspatial faerie hole until we reach 11 mana and use all delete to remove all of Dokindam X's seals as well as the opponent's creatures in the battle zone, his hand and shields, leaving him defenseless to a dokindam X direct attack. However, we need a few options to deal with threats. Demon Wolf, Castle of Betrayal: A very powerful 2 cost discard that won't get used often for me, but when you pull it out it's even worse than Cramium Clamp in my opinion (If Cramuim Clamp actually existed in OCG.) If you are sure your opponent has no berlins or Ryusei Kaiser, you can easily bring it out and the opponent will get wrecked for the whole day. Miracle Star, Time Caster: Everyone hates discard, and Miracle Star will stop most of them since this deck has lots of spells. In case if your opponent discards you with anything but Black Psycho you can simply recover all of the spells discarded at once. And since the spells in this deck have varied costs, you can get back lots of advantage. You can also revolution change it from kernel to recover spells, but i don't recommend it since you are better off using Puchohenza. Puchohenza, Mia Moja: A must in all big mana ramp decks, it can easily allow you to stop rushes. Don't break shields with it, you can attack tapped creatures with it and attack nothing. Then it places (almost) everything your opponent has into his mana zone and put pressure onto your opponent by forcing most of his creatures to enter the battle zone tapped. If your opponent has no way to remove stuff he's dead. It can also revolution change from Gaial Kaiser in order to remove more stuff. And it also removes your creatures which allows more of the opponent's creatures to be affected. Oriotis Judge and Tram Tech's Wave Go! : Anti Enemy Dokindam. If you use all delete and when both sides have Dokindam X, your Dokindam X will be sealed and you will lose. So we need special tactics against it. Team Tech's Wave go allows you to draw out the Enemy Dokindam X and next turn you can cast All delete or Oriotis Judge to get the Dokindam Out and make your opponent lose. If both of them are in your shields and you can cast them in the same time it will be even better, but the chances are quite low considering TCO shuffles. Using this way you can even remove dormageddon X since Tech Go removes all of dormageddon's cores. 4 copies of each must be ran for maximum efficiency. Promethus, Splash Axe/Geo the Man, Earth Titan: Recover All deletes or other key compartments placed into the mana zone. Green White Hole: Excellent defense when paired up with Prin. Just don't rely on it as it's restricted. Volgs, but there's a sizable amount of creatures. Hibiki. Guaranteed 1 mana loss. Rafululu, although i can use Kernel. Just like most big mana Rush is lethal. Batou Shoulder or Sido. NO, JUST NO......PLEASE!!!!!! Fell free to rate and comment about this deck.